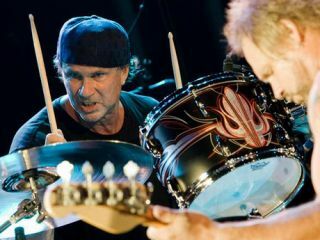 Chad Smith, drummer for the Red Hot Chili Peppers and Chickenfoot, collapses into a sofa backstage at The House Of Blues in Atlantic City, New Jersey. 'The Foot,' as he calls the supergroup he's a part of, are due on stage in 20 minutes, and he's only now arrived - barely. Smith had planned on being at the venue hours prior, but Hurricane Bill's crushing winds kept two planes grounded, forcing him to charter a two-seater ("I got a 70-year-old pilot to fly me, and he was awesome!") to transport him from his Montauk, Long Island home to tonight's show. "I have two hands and two feet," Smith says, ripping open a bag of beef jerky, "but sometimes I feel like I need three of me to be in all the bands I'm in. Not that I'm complaining." In addition to the Red Hot Chili Peppers and Chickenfoot, Smith is also a member of The Bombastic Meatbats, or Chad Smith's Bombastic Meatbats to be precise ("I didn't choose that name," he insists. "A promoter in Japan came up with it and it stuck"), a loose, funk-rock collective who are issuing their debut album, Meet The Meatbats, 15 September. The Meatbats grew out of Smith's recording with former Deep Purple bassist and vocalist Glenn Hughes. Before and after rehearsals with Hughes, Smith and keyboardist Ed Roth would jam out. Pretty soon, guitarist Jeff Kollman and bassist Kevin Chown climbed on board, and thus, the Meatbats were born. "I wasn't looking to form another band," Smith says. "Not with the full plate I have. But the stuff we were doing was too good, too fresh. I said, 'We've gotta record this.'" "I'm really proud of the record," Smith says. And at that moment in struts Sammy Hagar, who says, "What is he, talkin' about those Meatballs again?" The Red Rocker lets out a laugh and fixes himself a pre-show drink of - what else? - Cabo Wabo Tequila. "Brother, they're cool," he says, measuring a Super Big Gulp-sized portion of his elixir. "I'm down with the Meatbats. But if they steal my man Chad away from Chickenfoot, I'm gonna have to hurt someone!" Hagar chortles and splits with his industrial-strength cocktail. Smith leans forward, shakes his head and grins wearily. "It's a weird life I lead, trying to be in all these groups and give a hundred percent to each one. But that's my gig. I made my beds so now I've gotta sleep in them." Next: What's up with the Chili Peppers? You just joked about it, but the question is, how can you divide your time between three different bands? "Luckily, everybody is very cool about my situation. The Chickenfoot guys, who I love dearly, they've been great about the fact that, come October, I'm going to be doing the Chili Peppers again. They could have acted not so cool about it, but they knew going into this that I was still part of the Chilis." Is October when you originally saw going back to the Chili Peppers? "Hard to say. We initially decided on a year's break, then that turned out to be two years. It could've been longer. It's been a very fruitful time for us: I did Chickenfoot and the Meatbats, Flea went back to school, Anthony's been doing a TV project. "It was important to be people again. We've traveled, had babies, hung out with our families - lived our lives, you know? So now we're very fired up to give the Chili Peppers our all." Do you have any demos written? "There's ideas floating around. One of them dates back to 1999, I think. Flea, Anthony and I did jam recently. That felt good. But as far as demos go, we'll just start writing in October." What about John Frusciante? He's the one guy who's always been in question. In fact, earlier this year he told me that he had "no plans" to do anything with the Chili Peppers. "I know he said that. Like all of us, he was coming out of a real Chili Peppers pressure-cooker. I'll be honest: I haven't seen John, but Flea had a sit-down with him recently, and from what I understand it was very positive. I have every reason to believe that, come October, we'll all four be making music again as the Chili Peppers. John's a very important component of the band. I love the guy. He's an incredible musician." In the meantime, you also have The Meatbats - or Chad Smith's Bombastic Meatbats. This came about because of your work with Glenn Hughes. So why isn't he in the band? "So that's what we did. We went to my house, wrote the songs out, recorded 'em with a producer named Jono Brown, and that was that. It's fun material. I think people'll get off on it." The record has a cool retro vibe. It feels like the best Billy Preston record that Billy Preston never made, particularly the song called Oh! I Spilled My Beer. "You know, Ed's totally into the retro keyboard sound. He plays Clavs, Wurlies, all those things. Billy Preston - absolutely. It wouldn't be wrong to say he wasn't an influence on our music." The record has a very loose feel. Did you record it live? "All live - by design. We wanted to sound like a live band jamming. We didn't fuss over it at all. Well, there were a couple of fixes here and there, a few piano overdubs, but no big deal. We didn't record it in parts." How would you say your style changed in the context of the Meatbats? "Well, there was a lot more room for me to stretch out, which was very rewarding to me as a drummer. I got my groove on, sure, but I tried not to overplay. I served the music." The songs are very comical in nature - tracks like Pig Feet and Death March - but a few of them, tracks like Night Sweats, Into The Floyd and Lola, go into some dark places. "That was the idea. We wanted it to be a party kind of record, but these guys are great lyrical players, full of melody, and songs just flow right out of them. I didn't see any reason not to include different things here and there on the record. We're not one-dimensional at all." Are you guys going to be able to tour? [laughs] "No! Not a 'tour' tour. We're going to be more like a wedding band and play on the weekends. Select gigs here and there, probably in November. We've got a few things lined up. I'd love to play a lot of shows with them, but there's just no way." And what about Chickenfoot? After you do the Chili Peppers, are you going to do another record? "Absolutely! We're having so much fun and it's gone so well - there's no reason not to continue with Chickenfoot. That's something I want to make very clear: Chickenfoot isn't a one-off thing for any of us. We're a band. "I would imagine during my time with the Peppers that Joe will probably do another solo record, and maybe Sammy and Mike will do something on their own. But as soon as I'm done with the Chili Peppers, I'm diving right back into Chickenfoot. We're going to outdo this record, too. That's the plan and I'm sticking to it."